I love looking at what's in other people's refrigerators. It's a quirky voyeuristic thing, but I am clearly not alone. Back when I used to keep a personal blog, I was a proud member of Fridge Fridays. I loved going and looking at all the pictures. There are whole photo groups dedicated to this on Flickr. So, today you get to have a peek inside mine, but I get the advantage of having to clean it out first! 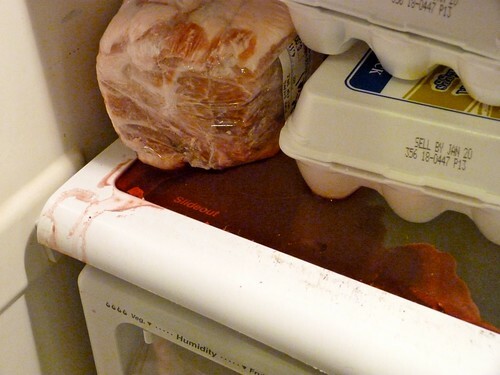 I hate when this happens, but at the same time it forces me to give the fridge a good cleaning. You just know that the meat leakage has all kinds of food borne bacteria just funking up my fridge. And it used to send me scrambling for the bottles of mega-cleaner that kill 99.9% of bacteria. Because, well, I wanted my family to be safe. So, I would spray down the shelves and the drawers of the refrigerator with these 99.9% bacteria killing mega-cleaners and then (wait for it...) put my organic fruits and veggies right into them! Perfect, right?! You know, the organic fruits and veggies that I would splurge on at the grocery store so that my family wouldn't be ingesting a bunch of chemicals and pesticides. HA! How I laugh at the ironic stupidity of it all! Can you just imagine all the chemical residue of various killing "pesticides" that were in my mega-cleaner and were now on my fruits and veggies?! I amaze myself. So, you and I can safely use What-EVER to spray down our fridge, our counters, our microwave turntable, or anything else that comes in contact with food, because we don't have to worry about chemical residues from Better Life products. So, here's the Frowzy Fridge! We may have hummus, cream cheese, and yogurt addiction issues in our house. Mr. Frowzy purposefully put his lone can of what he calls our "house beer," PBR Light, right out front so you could see how he rolls. 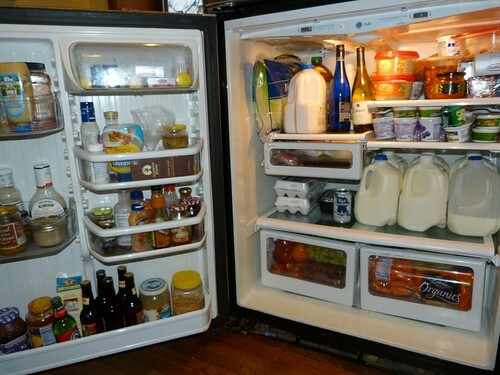 If you want to join in the voyeuristic fun, post a picture of your fridge on our Facebook page! And just to prove how sick I am, I am going to award a one year supply of Better Life products to one of the photos! You read that right, One-Whole-Freakin-Year of Better Life products. All you have to do to enter is post a picture of your fridge! Right here!